Observability (in software world) means you can answer any questions about what’s happening on the inside of the system just by observing metrics from outside of the system, without having to modify the working deployment to support this. Without an observable system, it would be difficult to understand what is going wrong with the system unless you are monitoring for known issues. At any point of time, you should be able to ask any arbitrary question about how your application works. With this external information available, you can ask meaningful questions in a production deployment to find what went wrong internally, or why your GraphQL backend is behaving the way it is. 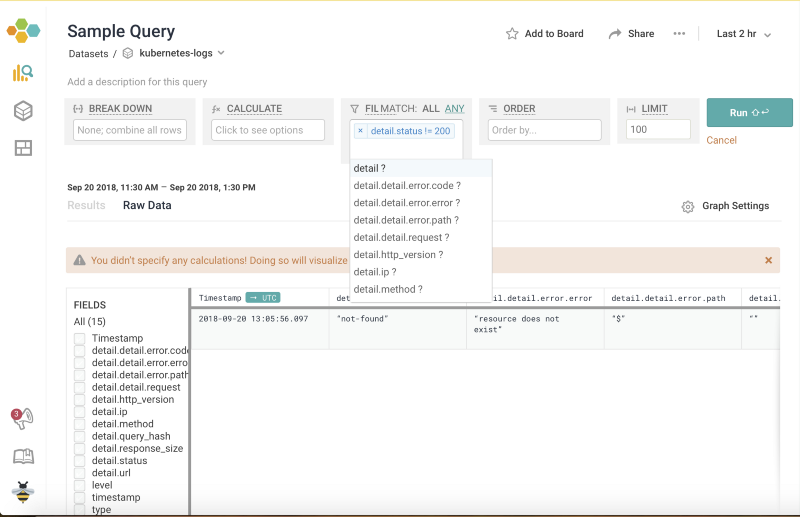 For example, if you see anomalies in query execution time for a particular query hash, you can try to identify what is wrong with the query (may be there is a database bottleneck that you need to optimise). Just having this information set up for monitoring also might not be enough. 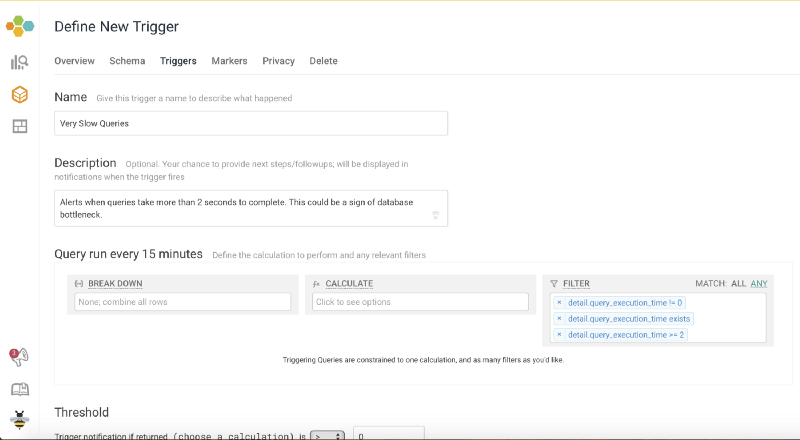 To make it meaningful, you can set up alerts — for example: triggers for requests/min, errors/min with thresholds and get notified when the server is behaving differently. 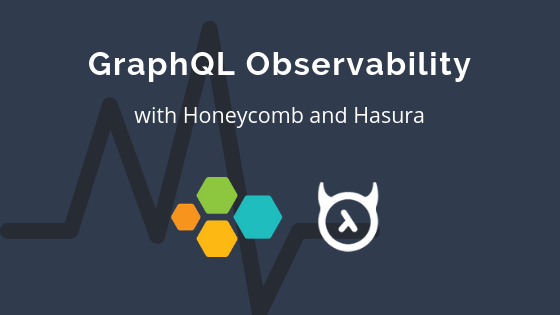 By the end of this tutorial, you should be able to setup Hasura GraphQL Engine with an observable system, Honeycomb in this case, and help you understand, optimise and control your GraphQL server. Here’s a preview of what you will get at the end. You can also choose to create a visual view of your logs based on filters. For example, to monitor error codes across a given time interval. This documentation assumes that you have Hasura GraphQL Engine installed on Google Kubernetes Engine. Instructions for deployment is available here. Signup on Honeycomb to start the Kubernetes agent setup. Honeycomb uses kubernetes secret to store the API key. This will be available on Honeycomb after Signing up. We will use Kubernetes DaemonSets to automatically deploy the Honeycomb Agent on all nodes. Execute the following command to start sending cluster events and resource metrics from kubernetes. Deploy kube-state-metrics and the Honeycomb kube-state-metrics adapter to collect more fine grained data. Head over to the Honeycomb UI and query the kubernetes-state-metrics dataset to verify if everything is working. Verify graphql-engine logs by executing the following command. Here -c is specified because hasura-graphql-engine has multiple containers running. 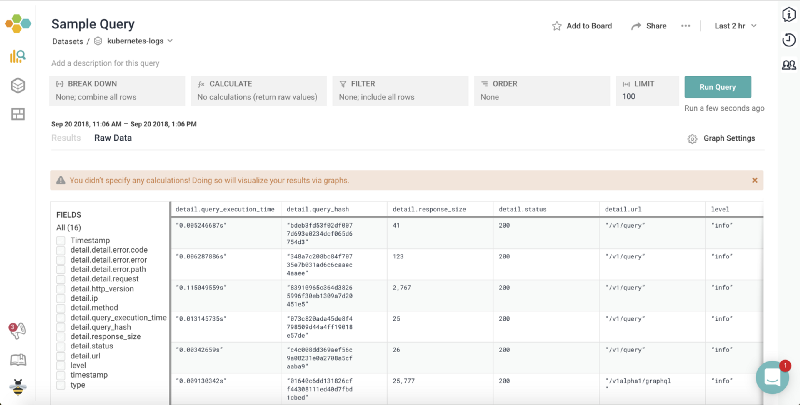 In the Honeycomb UI, go to the kubernetes-logs dataset and open the Schema tab. Scroll down to see options. Check the `Automatically unpack nested JSON` and select the level of nesting to `5`. You can now get detailed report on the logs / apply filters depending on the requirements. You can see query_execution_time, query_hash, response_size, status code etc for inspection. Now start apply filters to get granular details. Lets apply a filter to get all queries which resulted in an error. The filter would be detail.status != 200 . Here’s what the dashboard looks like. Now that we have got a holistic view of your GraphQL queries, let’s set up an alert to get notified via Email when something is wrong. We can apply a filter for query_execution_time ≥2 to get notified for slow queries. This is just an example. You can tweak the number of seconds to a desired value depending on the application requirements. Now, the focus can be on the application development and this observable system setup could notify us on whats going wrong with the unpredictable parts of your GraphQL server.